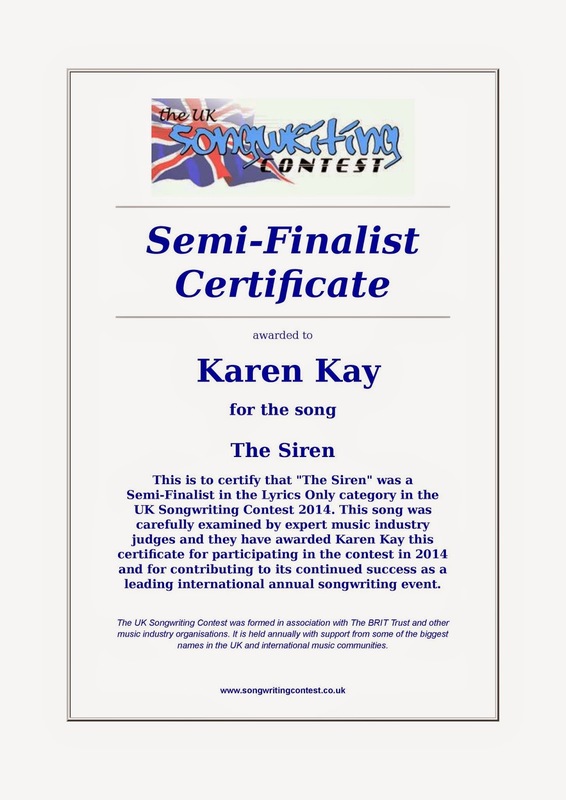 I am pleased, nay, proud to announce that my song, The Siren, reached the semi finals of the UK Songwriting Competition. The final results have been published and I have been awarded the above certificate. Once I had submitted my song to this competition, I realized a number of things. I suppose you could call that some kind of epiphany. I knew that no matter what, whether it was ignored, praised or somewhere inbetween, I was completely happy with it. It feels to me like my material has landed. This is what I write ... this is what I've got to work with. Oddly, no matter what anyone else thinks, I like what I have written, it delights me. It makes my brain say 'wheeee' and 'way hay'. I also realized what the heck it is that I write. What genre, what style, what music. I have always loved stories, particularly stories with an element of fantasy. If there is such a genre, mine would be the meeting point of story telling and music. Is there such a genre? I also love stories with fantasy or magical realism elements, so that's in there too. I love jazz, blues and improvisation and have listened to a lot of rock too. So far, music is what you get when blues meets jazz meets improvisation meets sounds meets recorded sounds. All are mixed together with a sprinkling of beauty. So having had this realization, it feels like my task is to put songs out into the world in obvious an unobvious places. Then the joy of getting a thumbs up or praise is now a way of finding a place to be able to share and perform what I seem to have written. All I do is to just keep sitting down and working and this is what turns up. It's about locating an audience who will enjoy these kinds of stories, this kind of music. Part of the adventure is not knowing exactly what that is going to look like. A big thanks to the UK Songwriting Competition. It felt like a bit of an unobvious place to seek a thumbs up... this certificate is gravy over mashed potatoes (ok I borrowed that line from Pat Pattison, songwriting teacher extraordinaire!) (more about songwriting and Pat another time). Bring on the next thing!